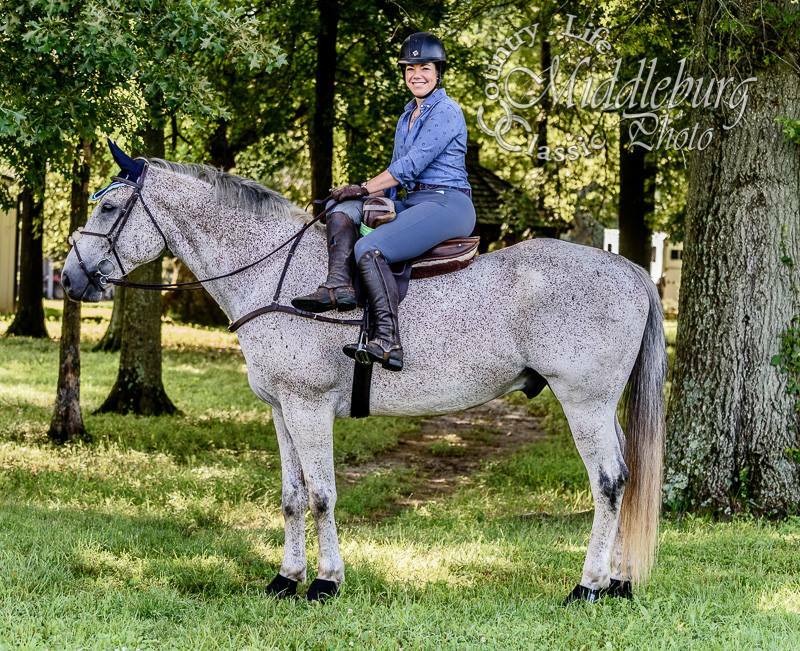 10 yr old, 17.1 hh, gray Irish Draught-TB gelding. Paddy is an experienced fox hunter in both the jumping and non-jumping fields, who has also dabbled in the local hunter/jumper show ring and horse trials. Sold to a hunting home in VA! 13 yr old, 17.3 hh, dark bay, Dutch WB-x gelding. The epitome of a packer! Experience up to 1.15 m show jumpers, 3'6" hunters, and now a top quality first-field hunter astride and aside. Sold to a show home in PA! 9 yr old, 17.1 hh, black reg. Hanoverian gelding. Gorgeous show & field hunter. Very brave, hack winner, good form over fences. Sold to a show hunter home in GA! 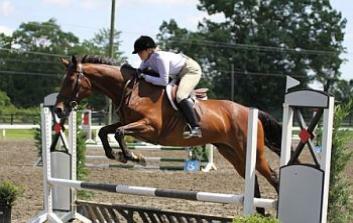 9 yr old, 15.3 7/8 hh, chestnut KWPN-NA mare by Consul. Zeda has shown at both local VHSA and rated USEF shows in the hunters up to 3', with the scope/step for the 3'6". She is an excellent, hack-winning mover. Additionally, she is a fabulous 1st flight field hunter, and has hunted first field for four seasons. Sold to a show hunter home in CA! 13 yr old, 16.2 hh, chestnut TB gelding. Lovely all-around horse! Currently hunting first field. 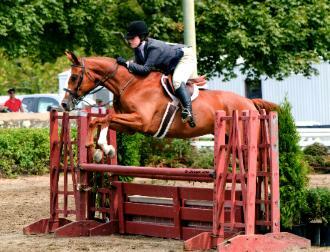 He is a good mover and jumper with local show mileage. Has 2'6" show mileage, and schools up to 3'6". Can go in both the hunter and jumper rings or do lower-level eventing. Sold to a show hunter & eq home in VA! 6 yr old, 16.3 hh, bright bay, draft-x gelding. 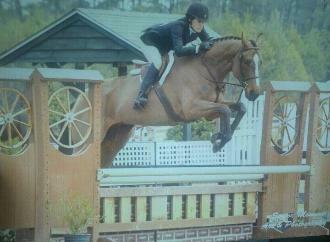 William is going to be an amazing eventer! Currently hunting in the second field, he is super brave x-c and a very good mover. Sold to an eventing home in MA! 7 yr old, 16.2+ hh, dappled gray TB gelding. Good mover, excellent jumper. Won a yr end championship at 2'6", now showing at 3', has hunted 1 season first field. Scope/step for 3'6", potential Eq horse--VERY rideable! Sold to a show hunter home in VA! 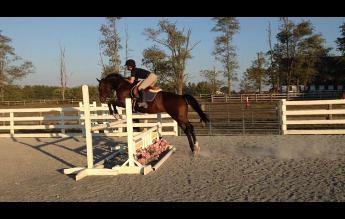 10 yr old, 16.1+ hh, dark bay, Dutch WB/TB gelding PACKER 3' or 3'6" hunter. Champions and reserves in the A/A, sidesaddle, and excellent ribbons in A/O's and Lg. Jrs. Plus, he is a Champion Fieldhunter. Sold to a show hunter & eq home in VA! 8 yr old, 16 hh, bay paint APHA gelding. A lovely children's hunter with a "10" jump, he is also an excellent mover, an experienced foxhunter, and almost ANYONE can ride him! Sold to a show hunter home in OH! 6 yr old, 15.3 hh, gray TB gelding. Fantastic event or show prospect. Amazing mover and jumper. Incredibly athletic, scopey and brave. Sold to an eventing home in VA! 8 yr old, 16.2 hh, reg. Hanoverian, dark bay gelding by DeLaurentis. Duc is incredibly sweet, very quiet, brave, a superb hunter mover, and is coming along nicely over fences. He is currently hunting first and second field with the Middleburg Hunt. An amateur's packer in the making! Sold to a show home in VA.
8 yr old, 16.3 hh, dark bay Dutch WBx gelding. A made field hunter, also w/show experience in the hunters, jumpers, and sidesaddle. Very comfortable, great jump, excellent mover. Fancy! Sold to a fox hunting home in VA! 5 yr old, 15.3 hh, black, WB/TB/QH gelding. Lovely event prospect and field hunter. Excellent mind, incredibly sound, and very willing! Cute mover, loves to jump, top form. Sold to an eventing home in MD! 4 yr old, 16.1+ hh, blood bay, TB gelding. Here is a young prospect with a bright future in the hunters. He has been recently started over small fences at home, and is very brave. Sold to a show hunter home in NC! 6 yr old, 15.3 hh, pinto, reg. APHA mare. A packer in the making! "Fergie" is hilltopping beautifully this season, jumping around 2'3" courses with auto lead changes, and hacks out alone or in company. Very quiet, gorgeous mover, and a sweetheart personality. Sold to a show hunter home in VA! 5 yr old, 16.1+ hh, gray WB/TB gelding. A lovely, quiet guy, and ready to make into your next show hunter. Good mover, and has recently started jumping. Sold to a show hunter home in VA! 15 yr, 16.2 hh, bay, WB/QH gelding. Charlie Brown is a complete and utter packer! He has horse trialed through Training; shown in the 3' local hunters; and fox hunted for 5 seasons. Also has some movie tricks thanks to his previous owner. Super sweet, incredibly brave, very well schooled on the flat. Perfect for a re-rider adult or child. Sold to an eventing home in DC! 7 yr old, 17 hh, bay TB gelding. A hunt field packer! 3 seasons hunting with several NoVA hunts, and extensive event training with Olympian Torrance Watkins. Sold to a fox hunting home in VA! 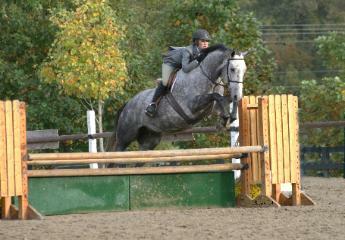 6 yr old, 16.3 hh, grey, Appendix QH gelding. "Stix" is an incredibly easy and laid-back guy. He is an exceptional foxhunter and frequent guest horse. He does everything on the buckle. Has show experience. Jumps 3'6"+ with ease. Sold to a hunting & eventing home in NC! 6 yr old, 16.2 hh, bay, WB mare. A lovely hunter prospect! Quiet, a lovely mover, good form over fences, lead changes, and a fantastic brain. Sold to a show hunter home in DE! 10 yr old, 16.1 hh, bay, reg. Westfalian gelding. Extensive dressage training and an amazing jump. Sold to a show jumper home in VA! 12 yr old, 17.2 hh, chestnut, TB gelding. BIG and elegant, yet a total puppy dog, he has hunted for 6 seasons. Great at giving beginner lessons. Sold to NC! 12 yr old, 16.3 hh, bay Holsteiner/TB gelding. PACKER field hunter. 8 seasons hunting in NoVA, goes first or second field, leads or goes in back. Also experience at local hunter and jumper shows. Sold to a fox hunting home in VA! 6 yr old, 15.2+ hh, chestnut TB mare. Belle is a lovely mover, and an exceptional event or hunter prospect! Incredibly brave to the fences, scopey, and yet very rideable. Sold to a Pony Club home in VA! 8 yr old, 16.3 hh, gray WB/Percheron mare. Lovely Event Prospect. Very brave, loves to jump. Sold to a fox hunting home in WV! 12 yr old, 16.1+ hh, dark bay Trakehner mare. 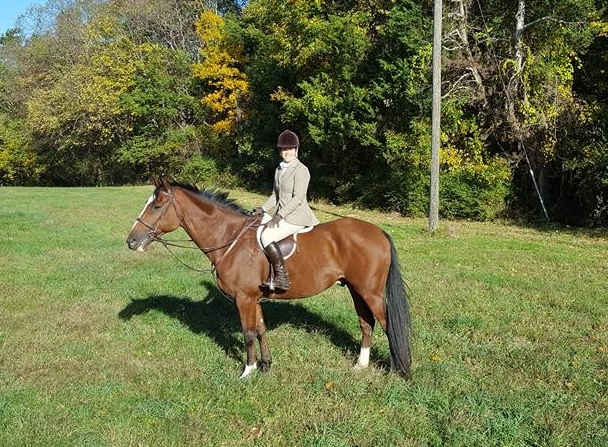 She has evented through Training level, done up to the level 5 jumpers, shown in the rated adult hunters and sidesaddle, was the high-point horse for Hunt Night at Warrenton, and is in her third season hunting first field. Sold to a fox hunting home in VA! 6 yr old, 15.2 hh, dark bay, Chilean TB mare. Luna is beautifully put together. She has a lovely toe-flicking trot and a gorgeous canter. Jumps in perfect form. Formerly a polo pony, she has foxhunted one season in the second field. Sold to a show hunter home in VA! 9 yr old, 17 hh, bay TB gelding. Perfect novice level foxhunter. He is a calm and easy horse to take in the first or second field. He has also shown in the hunters to 3'. Sold to a show hunter home in SC! 7 yr old, 16.2 hh, bay TB gelding. Lovely H/J, field hunter, or Event Prospect. He is hunting 2nd field now with Piedmont and will start showing in 2012. Good mover/jumper, easy lead changes. Sold to a hunting & eventing home in VA! 7 yr old, 15.2 hh, bay TB mare. Good local show hunter & fox hunter. VHSA show miles at 3'-3'6". Fox hunted 2 seasons. Goes side saddle, x-c, and is very brave & scopey. Sold to an all-around home in VA!